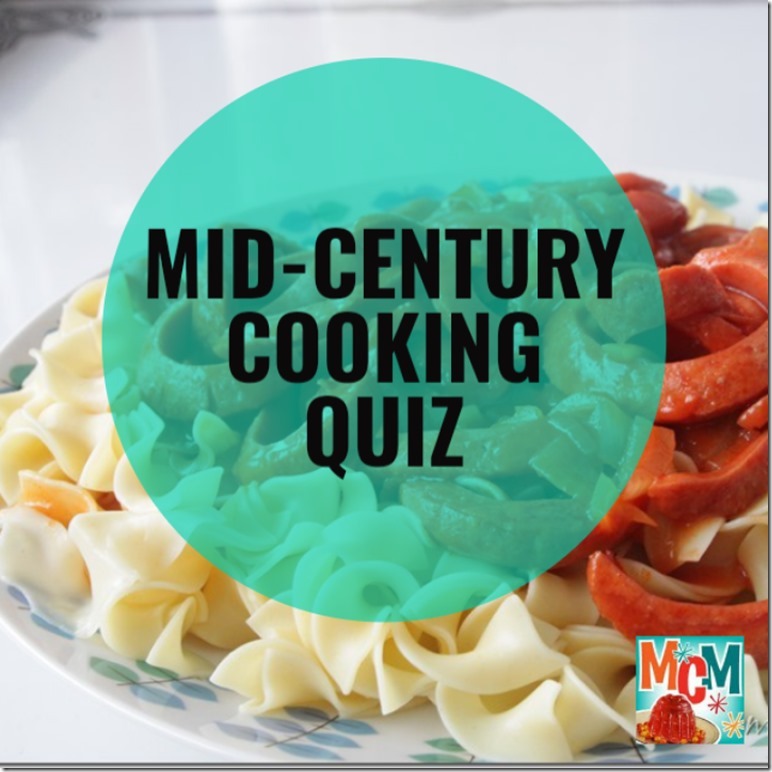 A Mid-Century Cooking Quiz to Celebrate 13,000 Facebook Followers! In honor of reaching 13,000 Facebook followers (yay!) and 1,000 followers on the Mid-Century Menu Facebook Group (also yay!) I wanted to do something fun and different this week. So, I decided to quiz all of you to see how closely you have been paying attention to my periodic rants and weird recipes. Behold! The thirteen-question Mid-Century Cooking Quiz! Feel free to write your answers in the comments below. I will post all the answers on the blog on Friday. 1. What is an alligator pear? 2. Name one flavor of Jell-O’s short-lived savory gelatin line. 3. How do you get onion juice? 4. How hot is the “moderate” oven setting? 5. What are acceptable mid-century food garnishes? 6. What do you add to prepackaged gelatin dessert to make it into a savory salad? 7. What is in Under The Sea Salad? 8. What is in California Dip? 10. What does the word “salad” mean? 11. How long should seafood be cooked? 12. How do you make basic white sauce? 13. What is PET milk? Also, I have a new email newsletter for anyone who is interested! It is going to be twice-monthly, and I hope it will be a more reliable way for you to keep track of me and see things that are going on right now and coming up! If you would like to sign up, you can go here. Thank you in advance! An alligator pear is an avocado. One flavor in Jell-O’s short lived savory line was tomato. Onion juice comes with canned onions. It probably comes in other forms, but I admit I’m not certain. A moderate oven is, I believe, 350 degrees? This one, I admit I can’t remember! Spry is/was a solid shortening brand! Do they still make it? Maybe! If you want to get technical, I think it means “salted…” But in Mid-Centurese, it generally means any chilled savory course. The rule I learned was 10 minutes per inch of thickness. I can’t remember the Mid-Century version. Thank you for your answer to #12! My sister inherited the ‘gravy gene’, not me 🙁 But my favorite childhood recipe (hello 60s) was Cream, Peas & Tuna Fish, on mashed potatoes, & I can’t make it! Thanks to your clear instructions, I’m going to give it another try! Aww, thanks! Ruth did an even nicer writeup with pictures somewhere in the archives. 🙂 1 tablespoon of butter/flour will give you a really thin white sauce, while 3 each will give you something really thick–binding, even, the kind that could hold a casserole together. For my personal favorite use, mac ‘n’ cheese, 2 is pretty good! A medium white sauce is a ratio of 1 to 1. One tablespoon butter, one tablespoon of flour and one cup of milk. Add more flour to make a thicker sauce. From my 1967 Home Ec class. I cried laughing with these questions. My answer to #11 was “WAY TOO LONG, like until it is super dry and inedible”. I thought #6 was “a canned meat”. What a fun, fun post.